Figure 8.8. Bland-Altman plots comparing results for Freelite and N Latex sFLC assays. (A) κ sFLC, (B) λ sFLC. (Reproduced by permission of SAGE Publications Ltd., London, Los Angeles, New Delhi, Singapore and Washington DC, from[©Lock, 2013]). A number of studies and EQA schemes have compared the absolute values returned by the Freelite and N Latex FLC assays (Section 39.3) . All have reached similar conclusions: the two assays do not compare well and are not interchangeable. Therefore, clinical cut-offs based on Freelite cannot be applied to N Latex FLC assays (Section 8.7). A well-designed study by Lock et al. compared quantitative results of Freelite and N Latex FLC assay for 327 serum samples submitted for analysis to four routine diagnostic laboratories in the UK; a total of 79% were from patients with known monoclonal gammopathies. Comparing the results produced by the two assays, standard linear regression gave r2 values of 0.86 and 0.71 for κ and λ sFLCs, respectively. This level of agreement is well below the requirements of the Clinical Laboratory Standards Institute (which requires an r2 ≥0.95 to establish that two assays are equivalent) . Bland-Altman plots identified 17/327 (5.2%) samples that had the most discrepant results (Figure 8.8). This included 14 patients whose sera contained clonal FLC that were “poorly detected” by the N Latex FLC but not the Freelite assays . Of most concern was the fact that 2 of the 14 patients had LCMM (prior to treatment) but their N Latex FLC assay results indicated normal sFLC ratios while their Freelite assay results were clearly abnormal (Table 8.8). These 2 patients and other examples of missed diagnoses are discussed in Section 8.6.2. A number of studies have reported that λ sFLC concentrations determined by Freelite tend to be higher than those reported by N Latex FLC assays . Caponi et al. suggest that this is due to differences in the reactivities of the two reagents towards FLC monomers and dimers. Whilst both Freelite and N Latex FLC κ assays recognise both monomeric and dimeric forms of κ FLCs, the N Latex FLC λ reagent only recognises λ FLC monomers, and the Freelite reagent reacts preferentially with λ FLC dimers. As the two assays are calibrated against different components of their respective calibrators, the two assays cannot be expected to produce equivalent results . However, it should be noted that these differences cannot fully explain all discrepant results, including some cases of missed monoclonal FLCs, which are further discussed in Section 8.6.3. Campbell et al. compared sFLC values reported by Seralite-FLC and Freelite assays for 120 patients with polyclonal FLCs and 209 newly diagnosed MM patients. 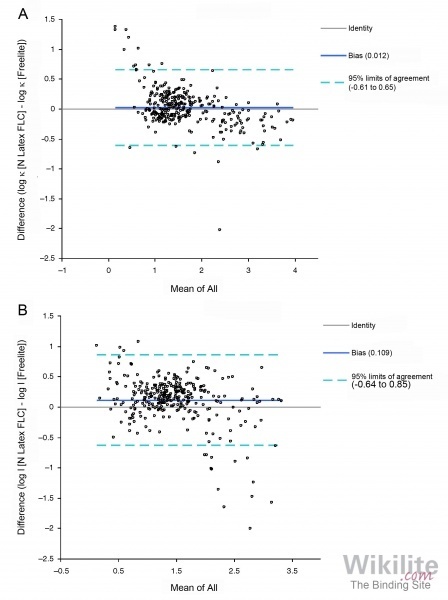 In general, absolute κ and λ values reported by the lateral flow assay were lower than those reported by Freelite. Consistent with these findings, a follow-on study by the same group  defined measurable disease by the Seralite-FLC assay as a dFLC >20 mg/L, which is substantially lower than the equivalent Freelite definition in international guidelines (iFLC ≥100 mg/L with an abnormal sFLC ratio, Sections 8.7 and 25.3). Jacobs et al. conducted a method comparison of Sebia FLC and Freelite assays using 501 patient sera and 208 healthy blood donors. The values reported by the assays correlated reasonably well, but absolute κ and λ values reported by the Sebia FLC assays were lower than Freelite, and these differences were particularly evident at high concentrations of sFLCs. Similar discrepancies have been reported by Caillon et al. in a comparison of 368 samples from 177 IFM DFCI 2009 trial patients . Jacobs et al. hypothesised that samples containing the highest Freelite concentrations may contain FLC polymers that may not be optimally recognised by the ELISA assays. The authors also state that Sebia FLC values were more coherent with those obtained by SPE, but SPE is not considered the gold standard for light chain quantitation as the technique is subjective, insensitive and inaccurate (Section 4.2.3). In summary, all comparison studies published to date have reported a poor concordance of results generated using Freelite and other commercially available FLC assays. This lack of agreement can be clinically important and is discussed further below. 18. Jacobs JFM, de Kat Angelino CM, Brouwers H, Croockewit SA, Joosten I, van der Molen RG. Evaluation of a new free light chain ELISA assay: Bringing coherence with electrophoretic methods. Clin Chem Lab Med 2018;56:312-22.